WindowSpace gives you more control over your windows. With this desktop utility (which comes in 32-bit and 64-bit versions), you can move and manipulate windows in ways reminiscent of many Linux window managers. You can maximize a window vertically or horizontally with a hotkey, minimize it to the system tray or have it 'snap' to the edges of other windows or the screen for smooth positioning. Move and resize your open windows using configurable hotkeys with WindowSpace. This program lets you use the keyboard for previously mouse-only actions, such as moving or resizing a window, by holding down one or more keys (such as the Windows + Alt keys) and using the arrow keys. WindowSpace includes a number of pre-defined hotkeys for its custom options, but you can change them to suit your preferences. The same goes for options listed when you right-click a window's title bar and look under the WindowSpace item. The latest 2.0 version of WindowSpace adds new window-management options, such as "rolling up" a window to hide everything but its title bar, or stretching a window to the top and bottom of your screen. 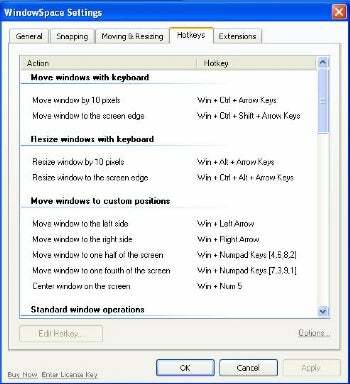 The new version also adds a number of new hotkey choices. If you typically juggle many open windows, WindowSpace could make managing them more efficient. On my test system, the lightweight utility used about 4MB of memory--less than the previous version did.